US 20xx $9.99 ×2 ? UK 20xx £7.99 ×2 ? EU 20xx €8.99 ×2 ? JP 20xx ¥1,500 ×2 ? US 2012-12-19 $9.49 ×2 ? EU 2012-12-19 €9.99 ×2 ? JP 2012-12-19 ¥1,500 ×2 ? 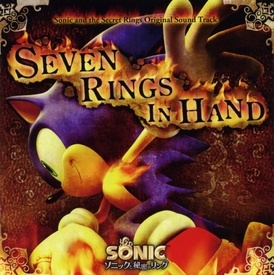 Seven Rings in Hand: Sonic and the Secret Rings Original Sound Track, also written as Sonic to Himitsu no Ring Original Sound Track (ソニックと秘密のリング オリジナルサウンドトラック), is the two-disc soundtrack album for the 2007 Wii game Sonic and the Secret Rings. It was sold exclusively on Sega Direct in Japan. The first disc, "Adventure", consists of vocal tracks, while the second disc, "Treasure", covers the game's original score. The Treasure disc (2) contains a "Digital Treasure Box", which can be accessed by any computer with a CD-ROM drive. This includes files that can be printed out to create a book cover that looks like the one from within the game, wallpapers and sound files for your PC, the game's trailer, a digital recreation of the soundtrack booklet, a large image of the game's poster, and a Sonic cutout printout. These files are only available on the physical release. In 2012 the soundtrack was made available as a digital download on iTunes and Amazon. Its title was shortened to Sonic and the Secret Rings Original Soundtrack, and the two discs were sold separately as Vol. I and II. This page was last edited on 11 December 2018, at 15:21.